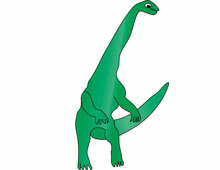 Diplodocus was an enormous dinosaur that grew as long as 100 feet. But most of this length was taken up by its incredibly long neck and even longer tail. Diplodocus' body accounted for only about 13 feet of its entire length, while its tiny head measured a relatively small two feet..
Diplodocus lived during the Late Jurassic Period and probably traveled in herds around what is now Colorado, Montana and Wyoming, feeding on the lush vegetation that thrived at the time. Though Diplodocus was a huge animal, it only weighed 11 tons, about one-eighth the weight of its 75-foot long cousin Brachiosaurus. Diplodocus was much lighter than other large plant-eating Sauropods because its bones were hollow. much lighter than other large plant-eating Sauropods because its bones were hollow. Some scientists, but not all, believe that when Diplodocus was hungry it could stand up on its rear legs and, using its huge tail for balance, stretch to nearly 50 feet above the ground in order to feed on the very tops of trees -- about 29 feet higher than today's giraffe can reach .